And finally we have made it into March and possibly that will be the end of this year's snow. It has marked the end of something else I've been working on which I have enjoyed immensely but has kept me toiling away quietly without really coming here very much so thankfully that's on the back burner for now. And so I have had some time to just play with fabric which has been fun. 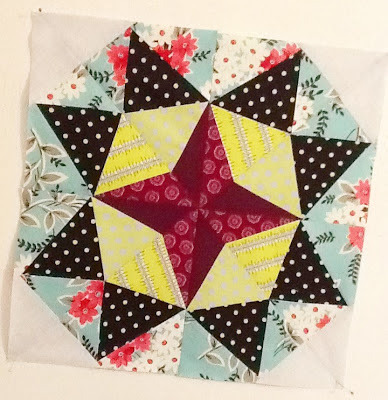 I've dug out the scrap bag, rolled lots of scraps through the Sizzix and made a start on the Marcelle Medallion quilt from Alexia Abegg's new book Liberty Love (picture below of the quilt from the book and stay tuned for a giveaway of both the book and some Liberty fabrics to go with it in the next few days...). 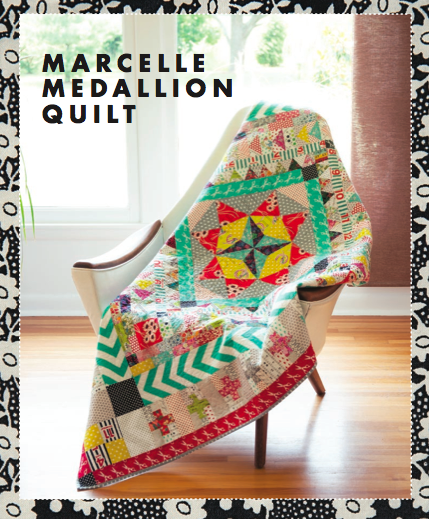 For anyone else making this quilt, there is an informal sewalong taking place on Instagram with the hashtags #marcellemedallion and #medallionalong where you can see other beautiful versions. I started with the centre. Although the book gives you templates for this, I decided to draw up foundation paper piecing templates with the added advantage of avoiding the y seams which were making me a bit nervous. I then added the first round of pieced borders with a set of equilateral triangles. Since the Accuquilt equilateral triangle die was almost the same size as the templates, I used that for fast scrap cutting and then added the slim aqua border so that the triangles would fit, a simple trick learned from Linda Rotz Miller over on Flickr. Then I added the next round of borders including a ton of flying geese. I cut these using the Sizzix 2" x 4" QST triangles die and the 2" HSTs die. Again, I had to do a bit of quilt math to make sure my bigger geese fit on the next border but it saved masses of cutting, marking and piecing time. I then added a black border because I love black in a scrappy scheme. And I have just now added the third round of borders replacing Alexia's brick border with a kind of scrappy checkerboard. 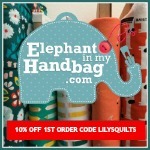 Again I chose this because I could cut the squares super fast with the Sizzix 2" square die. I think my next solid border is going to be the Timeless Treasures Citron or Aqua sketch. Although this is a scrappy quilt, I've based the scrappiness around a scheme of cerise, citron, aqua and black rather than true random scrappiness and I like the way the scheme pulls the scrappiness together. What about you? What have you worked on this month? Any finishes? Maybe a mosaic of everything you've been doing? One favourite thing? Link up at the bottom of this post to share what you've been working on. If you do link up, how about visiting at least four of the other blogs who link up - two above you and two below you - and stopping to leave a comment as well as visiting back anyone who visits you. As always here's the button to grab. And link up in the second linky if you are a blog with fewer than 50 followers and would like to get to know a few more people out there in blogland. Write a post about this feature, add this button and then link up. 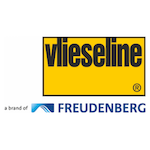 Next go and visit and get to know at least four other linked blogs - starting with the two above you in the linkys and the two below you. 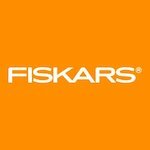 Visit those blogs, leave a comment, click to follow and visit that blog regularly over the next few weeks. Visit more if you have the time. And also visit back any new bloggers who come to visit you and get to know them and their blogs. Love your medallion quilt! Very fun indeed! 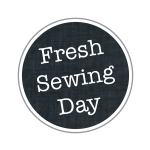 Thanks for hosting both Fresh Sewing Day and Small Blog Meet. I appreciate it, Lynne. I love your medallion quilt, it's lovely to see the progress photos and watch it changing with each border! Thanks for hosting FSD. The medallion quilt is stunning and such a great idea to paper piece it. It's looking gorgeous. Brilliant idea to loosely tie the scrappiness with an underlying colour theme. It has a really fresh feel to it. ooh Lynne it's beautiful! Great colour scheme and I totally agree the black looks fabulous with the scrappy. 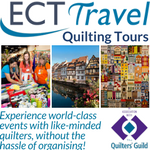 I love where your medallion quilt is heading - it's stunning! Love the colors in your medallion quilt! Such a lovely quilt ~ love how all the fabric works together. I've been working on lots of things this month ~ paper piecing, EPP and finally gave in and started a scrappy trip. So much to do and so little time! Ooh, I love that medallion quilt! That medallion is looking flipping amazing!!! I have got the magazine with the pattern but just need the time and courage to pick and cut into some fabrics!! The ones I've seen on IG are brilliant!! This quilt is a total delight from the first block and onward. I love your choice and combination of materials. It's good to see you back. How long will it be before we see the Great Mystery? Well the quilt is fab, amazing. 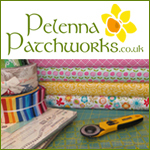 Imagine if you didn't have that cutting machine thing... As to what I have been up to this month, well obviously not sewing. But I can now stand upright for anything up to 3 minutes when I cross-country ski. 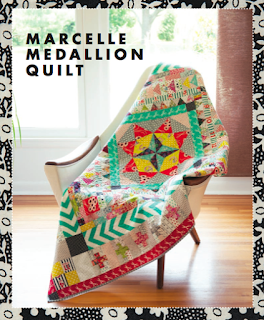 Loving the medallion quilt! You are so quick with your piecing! Maybe a dumb question...........but what's the easiest way to create a mosaic/montage of photos? Loving your medallioning - I think I might work backwards and adjust the centre to fit my sizzix borders, or maybe I might use my rotary cutter like in ye olde days! I love it! Beautiful. I've been lusting after that book for a while, might have to just splash out and buy it (I'm never lucky on giveaways!). 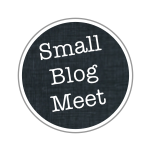 Thank you so much for hosting the Small Blog Meet - I'm brand new to this blogging business @ The Nocturnal Stitcher so its a great starting point and much appreciated. Gorgeous medallion quilt. I love the center block! Y seams are definitely scary! I think a lot of scrappy quilts are nicer if they stick with a chosen palette. Sometimes too much is just that - too much. Yours is nice but there was one I saw that lost something because it was too, too scrappy.